Note: an updated list, including a new printable, can be found here. 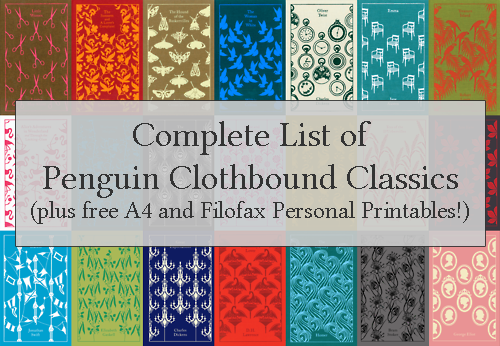 I love the clothbound editions of the Classics from Penguin. Aren’t they gorgeous? Slowly but surely, I’m collecting my own little library of these beautiful books, and have compiled a complete list of the 50 (plus one) titles to tick off as I acquire them. Below the jump is my complete list, including publishing date. If you’d prefer to have a list of your own, you can download and print the list as an A4 sized PDF, or as printables for your personal sized Filofax (as I’m currently using). In case you were wondering, the “plus one” I mentioned earlier is The Pearl, which was originally commissioned by the V&A Museum. All of the other 50 titles were commissioned by Penguin, and the whole set was designed by the talented Coralie Bickford-Smith. The list also includes titles which have not yet been published, and is correct as of the date this post was published (August 2014).